Performs around 100 tasks per hour. Gets interrupted every 6 minutes. In my Emergency Department, I probably get a new ECG handed to me every 15-20 minutes. Typically, these ECGs come from ATS category 2 patients that have been triaged but not yet seen by a doctor. When you are busy with your own workload, it is tempting to just “sign off” on the ECG, deferring further medical assessment until there is a doctor available to see the patient. Recognition of any of these killer ECG patterns should prompt expedited medical assessment and treatment. Q1. What are the main abnormalities present on this ECG? This patient presented to ED with pulmonary oedema after missing several dialysis sessions. Shortly after this ECG was taken, the HR dropped to < 10 bpm with no palpable pulse requiring a brief period of CPR. Bedside VBG revealed a K+ of 7.9. ROSC was rapidly achieved following administration of IV calcium. NB. 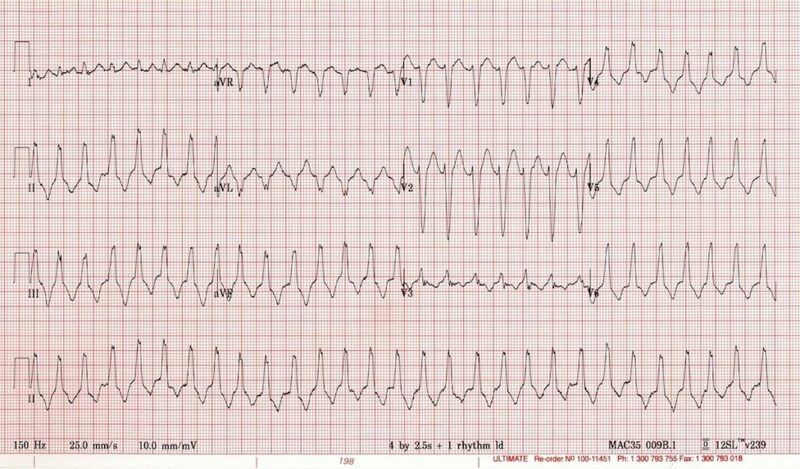 The differential diagnosis for this patient with severe bradycardia and 1st degree AV block would include beta-blocker and calcium-channel blocker toxicity. Q3. What are the other ECG manifestations of this condition? The presence of any of these ECG abnormalities should prompt rapid testing of serum K+ (e.g. by bedside VBG). Consideration should be given to empirical treatment with intravenous calcium whilst awaiting blood results (e.g. in a dialysis patient with profound bradycardia). Handy Tip – Always consider the diagnosis of hyperkalaemia in patients presenting with bradycardia or complete heart block, particularly if they have a history of dialysis, renal failure or treatment with potassium-elevating agents (ACE inhibitors, ARBs, K-sparing diuretics or K supplements). Unfortunately, the ECG is not sensitive enough to rule out significant hyperkalaemia — patients with relatively normal ECGs may still experience sudden hyperkalaemic arrest! These agents cause seizures and cardiotoxicity (hypotension, broad-complex tachycardia) in overdose. TCAs also cause tachycardia due to their anticholinergic effects. Atrial tachycardia, with regular P waves visible at ~ 160 bpm (many of the P waves are hidden within T waves and VEBs). Evidence of high-grade AV block — there is a 4:1 conduction ratio between P waves and QRS complexes, with a QRS rate of ~ 40 bpm. Frequent ventricular ectopic beats occurring in a pattern of ventricular bigeminy. 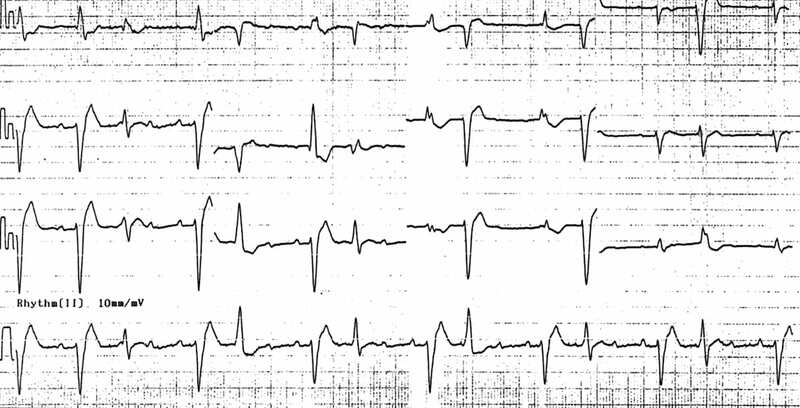 Alternating LBBB and RBBB morphology, with the conducted QRS complexes demonstrating RBBB morphology (RSR’ in V1) and the VEBs demonstrating LBBB morphology (dominant S wave in V1). 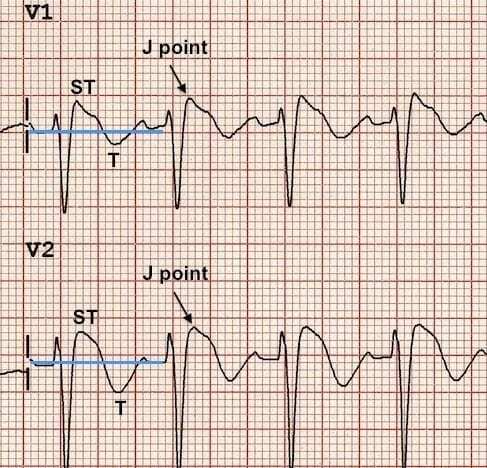 The combination of atrial tachycardia with high-grade AV block and frequent ventricular ectopic beats is almost pathognomonic of severe digoxin toxicity. Increased automaticity of atrial and ventricular tissues — via actions at the Na/K and Na/Ca exchangers causing increased intracellular calcium and therefore increased spontaneous depolarisation of cardiac pacemaker cells. Decreased AV conduction — via increased vagal tone at the AV node. Increased atrial automaticity — especially atrial tachycardia, but also atrial ectopics, AF, flutter. Increased ventricular automaticity — frequent VEBs and bigeminy, polymorphic VT.
AV blocks — including 1st, 2nd and 3rd degree AV block. Atrial tachycardia with high-grade AV block (= the classic dig-toxic rhythm). “Regularised AF” = AF with complete heart block + accelerated junctional escape rhythm, producing a paradoxically regular rhythm. Bidirectional VT = polymorphic VT with QRS complexes that alternate between left- and right-axis-deviation, or between LBBB and RBBB morphology. NB. Digoxin toxicity should not be confused with digoxin effect (= “sagging” ST depression and T-wave inversion in patients on therapeutic doses of digoxin; not predictive of toxicity). Q3. What should be done next? Assess for clinical stability +/- resuscitate. Further history to assess likelihood of digoxin toxicity (e.g. suspected overdose, long-term digoxin therapy). Check urgent serum potassium, creatinine and digoxin level. Consider need for empirical Digibind (digoxin-specific FAB fragments) while awaiting serum levels. The combination of low QRS voltages and electrical alternans is highly suggestive of massive pericardial effusion. The addition of sinus tachycardia is concerning for pericardial tamponade. Electrical alternans refers to a beat-to-beat variation in the QRS complex height, with alternating taller and shorter QRS complexes. It is thought to be due to the heart swinging backwards and forwards within a fluid-filled pericardial sac. Sinus tachycardia occurs as a compensatory phenomenon in cardiac tamponade, i.e. to maintain cardiac output in the face of diminishing stroke volume. It is of course non-specific, and may also be due to pain, anxiety, shortness of breath, etc. manifest with rapidly escalating inotrope requirements. Perform bedside echo to look for a pericardial effusion. This is very easy and requires minimal training. More advanced practitioners may be able to elicit specific signs of tamponade, such as RV diastolic collapse. Consider the need for emergency pericardiocentesis or ED thoracotomy (e.g. in trauma). 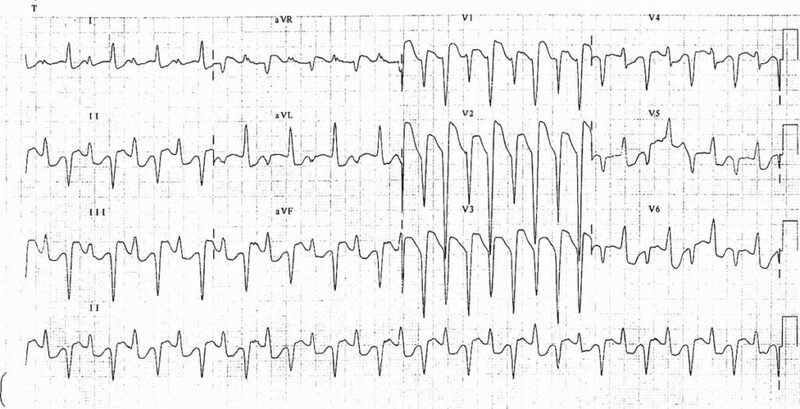 The differential diagnosis for widespread T-wave inversions and QT prolongation includes myocardial ischaemia (e.g. Wellen’s syndrome) and electrolyte abnormalities. However, neither condition would cause the gigantic “cerebral T waves” seen here. Obviously this is an artificial situation. 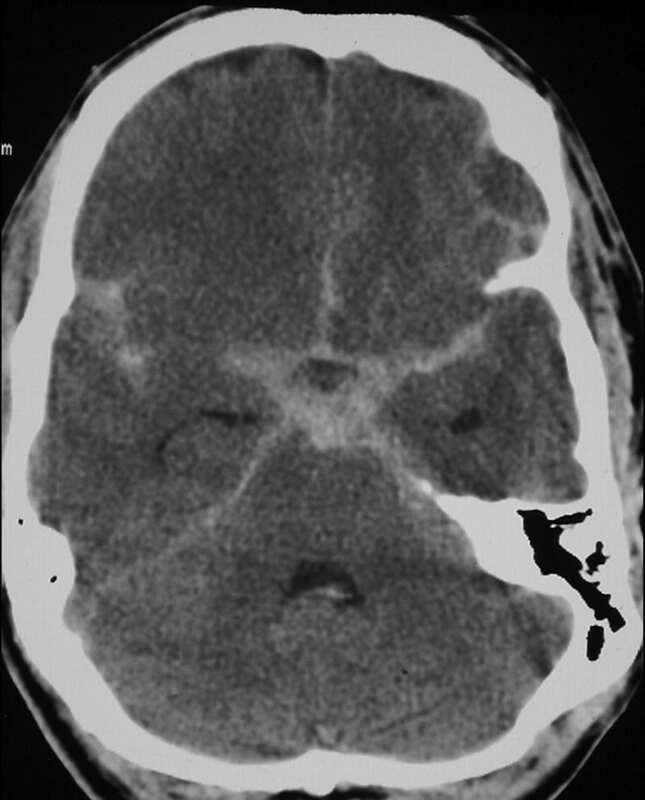 This patient is likely to be deeply comatose on arrival to hospital — potentially with focal neurology — necessitating early airway intervention, measures to reduce ICP, and expedited neuroimaging to confirm the diagnosis. The ECG should not be relied upon to make this diagnosis!! RBBB-like pattern with secondary R’ wave / J wave following the QRS complex. ST elevation at the J point > 2mm with a “coved” morphology — the ST segment slopes diagonally downwards from the J point, with a slight upward convexity best appreciated in V2. In a patient presenting with syncope, this ECG pattern is diagnostic of Brugada syndrome. Due to mutation of various genes coding for cardiac sodium and calcium channels (“channelopathy”). Inherited as an autosomal dominant trait. Most commonly seen in individuals from South East Asia (12/10,000 of the population), particularly males (80% of recorded cases are male), with onset of symptoms typically occurring at age 40. Associated with increased risk of paroxysmal ventricular arrhythmias (polymorphic VT, VF) and sudden cardiac death. Symptomatic ventricular arrhythmias (paroxysmal syncope, seizure-like events, nocturnal agonal respirations). 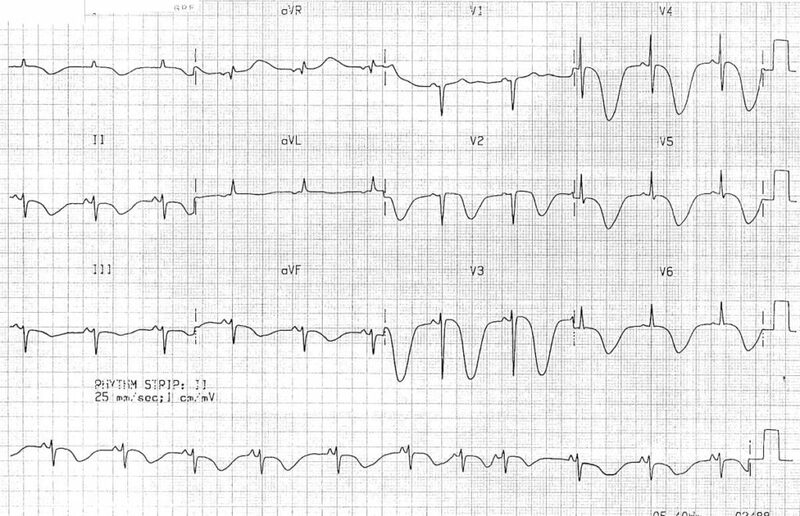 Asymptomatic – after family screening or incidental finding on ECG recording. The only effective treatment is insertion of an implantable cardioverter-defibrillator (ICD). There are three ECG patterns associated with Brugada syndrome, of which only the type 1 ECG is diagnostic. Changes need to occur in at least 2 of the right precordial leads (V1-3). The ECG pattern may vary over time: Patients with symptomatic Brugada syndrome may have a non-diagnostic ECG at the time of assessment (e.g. Type 2 or 3 pattern; even a normal ECG). A diagnostic ECG may be produced in these patients by administration of a sodium-channel blocking agent, typically a class I antiarrhythmic such as flecainide or procainamide. Interestingly, fever has also been shown to unmask the type 1 ECG pattern and may precipitate ventricular arrhythmias. Tip – the sensitivity of the ECG for detecting Brugada syndrome may be increased by placing leads V1 and V2 in the second (rather than the fourth) intercostal space. Positive family history: Sudden cardiac death in family member aged < 45; type 1 ECG pattern in family member. Arrhythmia-related symptoms: Cardiac syncope; seizure-like events; nocturnal agonal respirations. Documented ventricular arrhythmias: Polymorphic ventricular tachycardia (PVT); ventricular fibrillation (VF). Diagnostic difficulties arise when faced with patients that do not meet these criteria, e.g. 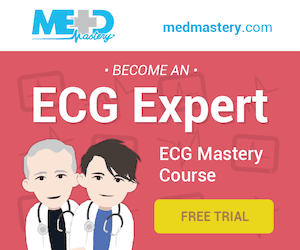 How Do I Manage My Patient With A Brugada ECG Pattern? These patients are admitted for cardiac monitoring and ICD insertion. This refers to patients with a type 1 ECG pattern but no positive clinical criteria. It is unclear whether these patients are at increased risk of sudden cardiac death. Further risk stratification with electrophysiological study (EPS) is recommended. Patients who develop PVT/VF during EPS are classified as higher risk and referred for ICD insertion. Patients with a negative EPS are followed up closely by an electrophysiologist, but do not receive an ICD unless they subsequently develop symptoms. As these ECG patterns are non-specific, the extent to which these patients are worked up depends on the individual merits of the case and the degree of clinical suspicion for Brugada syndrome. Patients with a compelling story for Brugada syndrome (e.g. recurrent cardiovascular syncope, resuscitated cardiac arrest) should be admitted for monitoring and further diagnostic workup — e.g. with flecainide challenge. Patients with asymptomatic type 2 and 3 patterns may require further investigation if there is a family history of Brugada syndrome. Dominant R wave in V1. Simultaneous T-wave inversions in the inferior (II, III, aVF) and anterior leads (V1-6). Subtle widening / slurring of the QRS complexes in V1-3. A small blip following each QRS complex, best seen in V1 and the inferior leads — the Epsilon wave. Q2. What is the significance of these ECG changes? Right axis deviation and a dominant R wave in V1 are signs of Right Ventricular Hypertrophy. Simultaneous T-wave inversions in the anterior and inferior leads (particularly leads V1-4 plus III + aVF) are referred to as the Right Ventricular Strain pattern, and are another sign of RVH. Localised QRS widening / slurring in V1-3 and the presence of Epsilon waves are signs of Arrhythmogenic Right Ventricular Cardiomyopathy (ARVC). An inherited myocardial disease (usually autosomal dominant) associated with paroxysmal ventricular arrhythmias and sudden cardiac death. Characterised by fibro-fatty dysplasia of the right ventricular myocardium. The second most common cause of sudden cardiac death in young people (after HOCM), causingup to 20% of SCDs in patients < 35 yrs of age. More common in men than women (3:1) and in people of Italian or Greek descent. Estimated to affect approximately 1 in 5,000 people overall. ARVD causes palpitations or syncope due to Right Ventricular VT. Symptoms are often precipitated by exercise. The first presenting symptom may be sudden cardiac death. Over time, surviving patients also develop features of right ventricular failure, which may progress to dilated cardiomyopathy. There is usually a family history of sudden cardiac death. Further investigation with echocardiography or cardiac MRI, looking for evidence of dysplasia, aneurysmal dilatation or abnormal contractility of the right ventricle. Management includes beta-blockers to suppress catecholamine-triggered arrhythmias, ICD insertion for high risk patients (e.g. previous cardiac arrest) and standard medical management of right heart failure (diuretics, ACE inhibitors, etc). ECG interpretation is essentially pattern recognition. 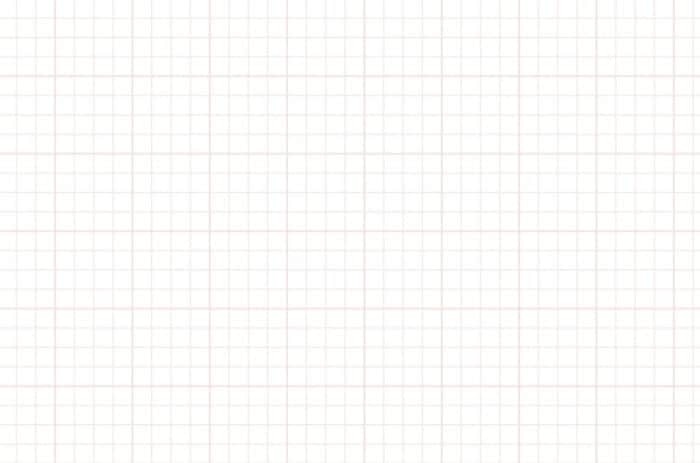 Calibrate your pattern recognition skills by looking at as many ECGs as you can. Further calibrate your skills by exploring some of the excellent ECG blogs out there, and by following up your own patients after confirmatory testing (e.g. angiography) to see whether your predictions about their ECG were correct. Remember that the ECG in isolation is rarely sensitive or specific enough to make a firm diagnosis — all of these killer ECG patterns require clinical correlation and/or confirmatory investigations. View Summary – Make sure you have attempted all the ECGs first! Awesome post! I’m going to use it for teaching our residents (with credits to you of course). 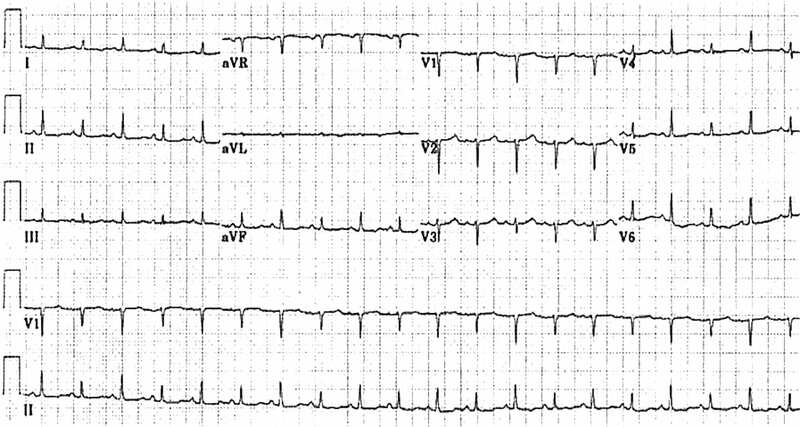 Only 1 question: Is a right axis of the heart not also typical for a TCA-intoxication?